The ALSC Blog reaches hundreds of librarians, academics, and children’s literature experts and enthusiasts daily. Administered by a professional blog manager working closely with ALSC staff, the blog consistently delivers high-quality, creative content. New content is added every day by a team of more than 15 regular bloggers, who contribute on topics related to children’s library service. 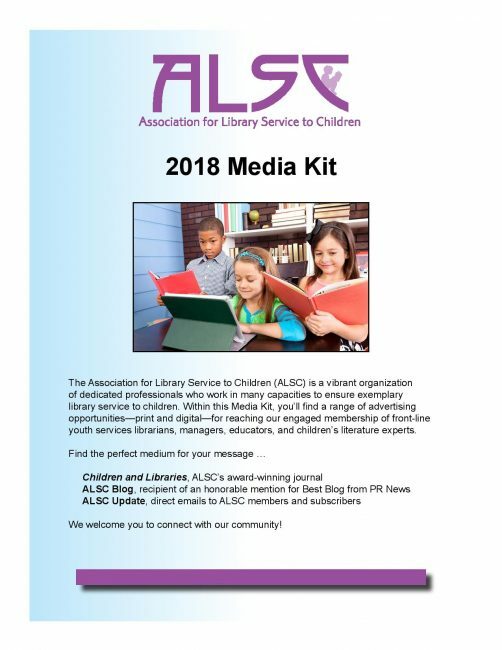 The ALSC Blog accepts advertising for goods or services of interest to the library profession and librarians in service to youth in particular. It encourages advertising that informs readers and provides clear communication between vendor and buyer. The blog adheres to ethical and commonly accepted advertising practices and reserves the right to reject advertising not suited to the above purposes or not consistent with the aims and policies of ALA. Acceptance of advertising in the blog does not imply official endorsement by ALA of the products or services offered. My grandchildren and I have just self-published a book entitled You Are Special Too, set in Africa and using animals to illustrate the loneliness of discrimination and bullying and the joy of recognizing differences and celebrating diversity. The book was illustrated by Gaye Sanders Fisher, a well known water colorist from Charleston, South Carolina, who fell in love with the book and wanted to be part of it. How would you recommend we get the word out about this book and hopefully get it into chiidren’s libraries? Congratulations on publishing your book! That’s quite an accomplishment. We get this question a lot. Usually we recommend this fact sheet from the ALA Library which contains helpful information about the publishing industry and the library market in general.